‘Does the idea of making New Year’s resolutions drive you batty? Do you hesitate to set goals or make plans, because your health isn’t cooperative? Do you feel like a failure, because you haven’t been able to keep your resolutions, or meet your goals in the past? This resonated with me this year, because I’m struggling with a fibromyalgia flare, and an unpleasant stomach reaction to a medication. I feel overwhelmed with daily life, so thank you Jo Moss for giving me permission to not worry about resolutions. 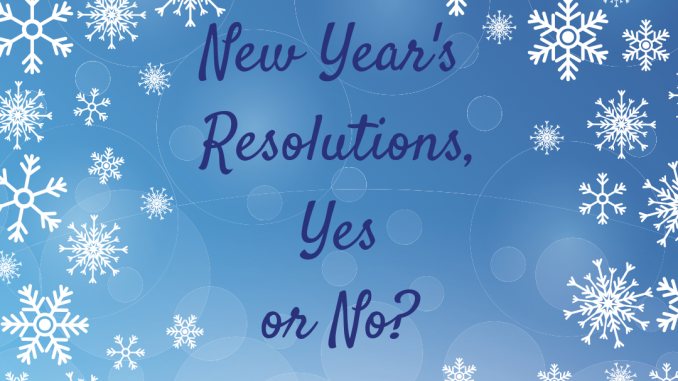 If Not New Year’s Resolutions, Then What? Last year I was intrigued by the idea to pick a word or phrase that would remind me of something important that I didn’t want to forget in 2018. So, I picked the phrase “LIVE LOVED” to remind myself daily that even when I feel alone, that I’m never really alone, and that I’m loved by God, my family, and my friends. I wrote it on my planner’s pages, and on my computer. I read it daily, and I believe that it did help me greatly. This year my phrase is “LET GO.” I seriously need to let go of the past, and situations that I cannot change. I want to step expectantly into each day without the baggage of yesterday weighing me down. If picking a word or phrase appeals to you, go for it!! If you love making New Year’s Resolutions, go for it!! Do what serves you well, and get rid of what doesn’t. Here are some resources to help you this New Year’s Day. 3. If you want to learn about why you may struggle with making, and keeping resolutions, check out Gretchen Rubin’s book The Four Tendencies. This link also includes a free quiz to determine your tendency, and how it impacts your goal setting. Or if you prefer to listen, you can hear an interesting interview with Gretchen on the Do It Scared Podcast epidode #38 here. So how will you DO this time of year? Select a word, make resolutions, set goals, or just keep keeping on? I’m planning on just keeping on. That’s enough for me. I’d love to hear what you’re doing in the comments below!! If you’d like to receive email notification of new posts plus access to my subscriber only resource library, please enter your email below. There’s nothing wrong with staying with what’s working for you!! I’m glad you came by and left a comment. I hope you have a peaceful and healthy year as well, Ruthy! For me, I think letting go is going to be a process of first acknowledging the event, and it’s emotions and finding some way I’ve grown from it, some good that came from it. Maybe writing a letter to it and then throwing it away. I did a lot of writing today and some artwork. I’m hoping it helps me put some things behind me.